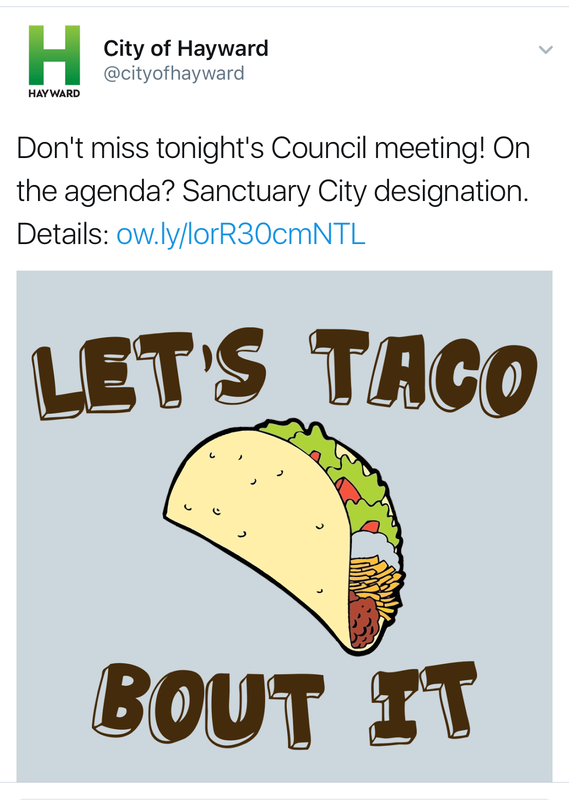 This morning, just hours before Hayward city council’s scheduled discussion of whether or not to become a sanctuary city, the city’s official Twitter account posted an image of a taco and the phrase “Let’s Taco About It” — a Tweet that has activists accusing the city of bigotry. Posted in Hayward, Hayward Collective, Hella Diverse, Luis Reynoso, racist, sanctuary city, tacos, Twitter. Bookmark the permalink. Tell us how you really feel Hayward City Staffers. Making light of a serious situation is not the way to promote your city's diversity. I guess Hayward is the now “All America Trump City,” Not right to target only Latinos as being undocumented. “No Room for Racism,” yeah right. Whoever approved that Tweet should be fired. Yeah, Hayward is a hot bed of Trumpism. Looks to me like this the case of another liberal virtue-signaller (think Blll Maher and house n***er ) thinking they are a comedian and getting the message wrong. Blame Trump. Blame Whitey. We all know that progressive Democrats are the true bigoted racists. Racist or white? No just some clueless employee who didn't think to check their tweet. Different from the Washington Bozo Billionaire's 2 a.m. covfefe tweets.